The 1972 United States presidential election in Texas was held on November 7, 1972. Incumbent Republican President Richard Nixon overwhelmingly won the state of Texas with 66.20 percent of the vote, to the Democratic Party candidate George McGovern’s 33.24 percent, thus giving him the state’s 26 electoral votes. This was the first time a Republican won the state of Texas since 1956. Nixon’s win in Texas made him the first ever Republican presidential candidate to break sixty percent of Texas’ popular vote in a presidential election, surpassing former President Dwight D. Eisenhower’s performance of 55.26 percent in 1956, and even native son Lyndon B. Johnson’s 63.32 percent in the 1964 election. Nixon is so far the only Republican candidate to break 65 percent of the state’s popular vote. At the county level, 246 of Texas’ 254 counties voted for Nixon, all by wide margins except heavily black Robertson County where Nixon won by a single vote. Nixon won 22 of Texas” 24 congressional districts – with the 18th (Harris County) and 20th (Bexar County) constituting the only congressional districts McGovern won anywhere in the former Confederacy. McGovern, however, did not win either county each of these districts were located in. McGovern’s only county wins came from the south Texas region along the U.S.-Mexico border and Cottle County in the northern part of the state, though even his performances here were underwhelming. In fact, in the oldest extant Democrat stronghold in the entire United States, Nixon became the solitary Republican since Theodore Roosevelt carried the county in 1904 to win La Salle County, the only Republican since Herbert Hoover in 1928 to carry Hidalgo County,[a] the only Republican since Dwight D. Eisenhower in 1952 to win Dimmit County and also Presidio County, one of only two Republicans since the county was founded in 1911 (following Eisenhower in 1956) to carry Jim Wells County and the only Republican apart from Eisenhower’s two victories there to win Wilacy County since it was created in 1921. This is also the last election at which Zavala County has voted Republican, though that county did so even in 1960. Duval County, however, gave McGovern over 85 percent of the vote, which was the highest percentage of votes he received in any county nationally. 1972 was the third successive election when Duval proved the most Democratic county in the nation. As with the rest of the country that year, with the exception of Massachusetts and Washington, D.C., Texas voted for the Republican candidate as Nixon emphasized on a good economy and his successes in foreign affairs, such as coming near to ending American involvement in the Vietnam War and establishing relations with China. 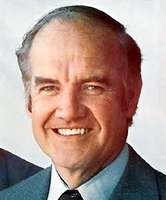 McGovern was constantly portrayed throughout the campaign as being a left-wing extremist because of his support for busing and civil rights, plus his opposition to the Vietnam War, support for granting amnesty to draft dodgers and support for a thousand-dollar giveaway to each American as a solution to poverty. McGovern was also viewed as inconsistent following the replacement of his first running mate, Thomas Eagleton, while many Republican campaigners believed McGovern would legalise abortion and illicit drugs if he were elected – despite the fact that his ultimate running mate Sargent Shriver was firmly pro-life. As of the 2016 presidential election[update], this is the best Republican election performance in Texas. Bill Clinton and his then-girlfriend (and future wife) Hillary (both Yale Law School students at the time) moved to Austin to work on the Texas McGovern campaign. Bill asked if I wanted to go too. I did, but only if I had a specific job. Hillary was tasked with registering black and Hispanic voters in South Texas on behalf of the Democratic National Committee. With the 1972 election being the first in which 18 year-olds were able to vote, the task of voter registration was much greater than in other years. Bill, meanwhile, worked closely with Eddie Bernice Johnson. He also worked with Ron Kirk (future mayor of Dallas), Ann Richards (future governor of Texas). He additionally worked with Steven Spielberg who, at the time, was a little-known television producer. He traveled frequently across the state to organize events and to hang posters in county courthouses. He spent considerable time in Dallas, where he had an office in the campaign's local headquarters on Lemmon Avenue. The Clintons worked on the campaign alongside Garry Mauro (future Texas Land Commissioner). Mauro would subsequently head Bill's 1992 campaign in Texas. They also worked alongside future Austin advertising executives Roy Spence and Judy Trabulsi, who would both go on to work on Bill Clinton's presidential campaigns. Spence would also work as a media adviser to Hillary in her 2008 presidential campaign, while Trablusi supported the candidacy of Barack Obama. Both worked in support of her 2016 presidential campaign. While working in Texas, the Clintons also networked with some donors that would later contribute to their own campaigns for political office, such as Bernard Rapoport. The Clintons, who were law students, were absent from attending their fall classes that term in order to work for the campaign. However, they both managed to ace their finals. While those working on the campaign expected him to lose in Texas, they worked in attempt to decrease his margin of defeat. ^ a b "1972 Presidential General Election Results – Texas". Retrieved April 13, 2016. ^ a b c d e f g h i j k Livingston, Abby (May 16, 2015). "Allies Remember a Driven Hillary Rodham During 1972 Texas Campaign". www.texastribune.org. Texas Tribune. Retrieved January 3, 2018. ^ Barnes, Bart (June 3, 2017). "Sara Ehrman, Hill staffer, Mideast peace activist and Hillary Clinton mentor, dies at 98". The Washington Post. Retrieved June 5, 2017. ^ a b Medley, Jasmine. "William Jefferson Clinton Presidential Center and the Clinton School of Public Service". National Association of State Judicial Educators. National Association of State Judicial Educators. Retrieved November 22, 2016.
a Nixon‘s Hidalgo County win is the only time post-1928 when a Republican has won any of the contiguous counties of Hidalgo, Starr, Brooks, Zapata, Jim Hogg, Duval, Webb or Maverick. This page was last edited on 8 February 2019, at 05:58 (UTC).